Fathers often see their daughters as royalty. But a few months ago, when Emily Heaton said she wanted to be a princess, her father Jeremiah quickly found her a kingdom. Many little girls would have been satisfied with the wooden turrets and ramparts of the castle in the community playground of rural Abingdon, Virginia, where the Heatons live. But Jeremiah was thinking bigger. 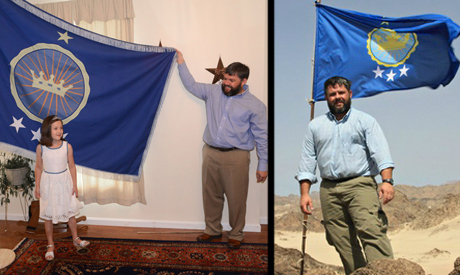 Last month, he planted a flag in a tiny parcel of uninhabited land on the border between Egypt and Sudan on June 16th, Emily's seventh birthday. The Kingdom of North Sudan was born. "With a child you don't want to ever tell them they can't be something they desire to be, and at age six, her frame of reference for the world was to be a princess," Heaton told AFP. "So I told her that she could be." Heaton started researching unassigned territory that he could claim as a kingdom. At first, the search was futile. "Initially I looked at the Antarctic continent, which doesn't have a population... but due to the Antarctic Treaty, there are no new claims that are allowed to be made," he explained. So, his Internet research eventually pointed him in the direction of Bir Tawil, a few hundred square kilometers (miles) of uninhabited desert nestled between Egypt and Sudan, long neglected in border negotiations. It wasn't long before Heaton was on a plane to Africa. "I didn't see the pyramids, I didn't see Luxor, I did not see Alexandria. It was specifically to go to the border area and make the claim on Bir Tawil. I'm probably one of the few people who've been to Egypt and not seen the pyramids!" he said. Heaton says the whole expedition cost under $3,000, and Emily says she has big plans for 'her' territory. "We're going to help kids in Africa that don't have food. We're going to build a garden as big as our land," she says. Heaton envisions an oasis of low-carbon-footprint agriculture funded by donations earned through an eventual KickStarter campaign, and even from supportive foreign governments. But can one man establish a kingdom on foreign soil? Edward Swaine, a professor of law at George Washington University Law School in Washington, says there could be problems. "At a basic level, he has to be correct in asserting that this is unclaimed land... That's not obvious to me that he's correct," Swaine said. "Beyond that, he has to establish effective occupation of this land beyond simply planting a flag or showing up and taking a selfie." Heaton says he is moving towards that goal, with office space in downtown Washington and a phone number already set up. He believes that recognition is a real possibility. "I think that once the Egyptian and Sudanese governments realize that we're going to be a positive force for change in the area... they will realize that it's beneficial to recognize the kingdom of [North] Sudan," he said, adding he hoped to soon enter talks with the two countries. The Egyptian and Sudanese embassies in Washington did not respond to AFP requests for comment. Even if Heaton's claim doesn't quite stand up to legal scrutiny, Swaine says there might at least be some consolation for Emily. "I think any little girl who declares herself to be a princess is such, and that's strictly speaking as a matter of international law," he said, tongue firmly in cheek. How much this will mean for Emily in the future is up for debate, but at least she seems to have received some kudos for it at school. Her friends think her recent ascension to the rank of royalty is "cool," Emily says.